Call us today to schedule a free foundation repair home estimate. We can fix your water problems and keep it out for good. The DynaPier® was engineered to be the strongest foundation pier available. The piering system concentrically loaded, meaning is installed directly underneath the footing. We do not drill into the footing for installation because this can damage the foundation. The patented DynaPier® was engineered to be the strongest foundation pier. The pier segments are pre-cast in a powder coated steel sleeve which is corrosion resistant. The outer casing is filled with a concrete core which provides superior strength and resistance, as proven in independent testing labs. Most foundation piers are constructed of either steel or concrete. The DynaPier® is one of the only piers that combines both for maximum strength and durability. The pier segments are driven into the ground using a hydraulic press. After one segment is driven another is connected to the top using our interlocking system and then driven as well. This process is repeated until the foundation pier hits bedrock or a dense strata. The foundation pier is finished by placing a steel cap on the top. Unlike most foundation piering systems, the steel shims are contained within the pier cap which allows no shifting when the soil swells or shrinks. The DynaPier® is a concentrically loaded pier, meaning it is installed directly underneath the footer which gives it one axis point. This alleviates any fail points and the installers do not risk damaging the footer by drilling into the side of it. The DynaPier® was engineered for durability. For more information on our piering system please contact us to schedule an appointment or visit the DynaPier® website for technical information. Check out the comparison of the DynaPier® compared to other common foundation piering systems. Read more about the DynaPier® and discover why it is far superior to the commonly used drilled concrete pier. Read more. 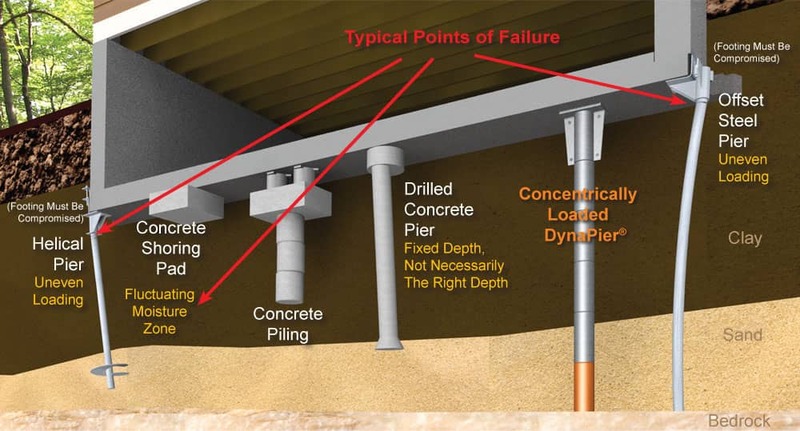 Read about the DynaPier® foundation pier compared to the common concrete piling pier. You will quickly see why the DynaPier® is far superior. Learn more. Read more about the DynaPier® compared to the offset steel pier. Discover why the DynaPier® foundation pier is a much better foundation pier. Learn more.